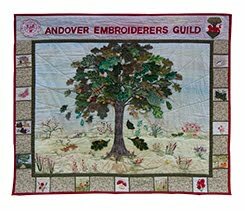 Annette Emms, a textile artist and storyteller, gave us a very amusing and informative talk last night about her adventures lurking around parish churches and sacred places. She is particularly fascinated by the architecture, medieval tiles, stone carvings and the stories behind the saints after whom a church is named. She uses this source of material to influence her work in the form of books, pictures, fairy shoes and much more. Her favourite place at the moment is St Melangell's church, deep in the Berwyn mountains in Wales. Annette told us the story of St Melangell, the daughter of an Irish king, who sought sanctuary in the valley and of how she became the patron saint of hares (and hunted animals). Afterwards she 'took' us to St Michael's Church in Castle Frome, Herefordshire, where the huge, stone, pre-Norman font is entirely covered in Celtic design. Next stop Cornwall, the land of the Celtic saints, a place brimming with stories and legends! Our 'tour' took us to Zennor Church to hear the story of St Senara. Still in Cornwall, she told us stories about the little people and of Skillwidden in particular. Annette's work is greatly influenced by these legends, with evidence throughout her work. Finally she talked about her love of angels and how she incorporates them into stitch. Thank you Annette for such an inspiring talk, we all enjoyed the evening and seeing your beautiful work.